Since Twitter's user interface redesign in June 2017, this method to upload Avi is no longer effective. In the desktop version of Twitter.com, it has forcefully set a default of 400x400 dimension when you click the Avi for its preview. This method is reportedly still useful for the Avi preview in the Twitter app on smartphones. 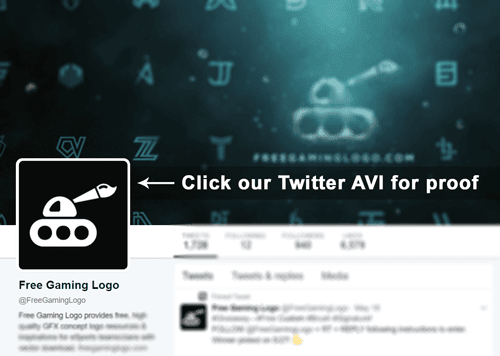 As of now, our methods on uploading Twitter header and Twitter timeline image are still effective. You must have been complaining for a long time before you stumble upon this perfect solution - Why is my Twitter Avi so blurry? Why does Twitter compress my profile picture so much? Why does my profile pic look pixelated? Why does my Twitter avatar look like trash? Why is my HD profile image of such bad quality? Why can't Twitter just fix the icon? No more complain. Here's the ultimate guide you've long been waiting for. Still got doubt? Proof is here. Visit our Twitter profile, preferably on a PC, to see it yourself. Click on our logo to see how clear, crisp, high resolution it is in the preview. Perfect, right? Time to get down to business. We promise it won't be hard at all, and will be a guaranteed success. Follow the steps below carefully. Do all the steps on a PC and reference the tutorial images if needed. Time to say goodbye to your blurry Twitter Avi and welcome your HD image and show off. Transparency is needed to retain a PNG as PNG after upload. Visit this Twitter Avi uploader. 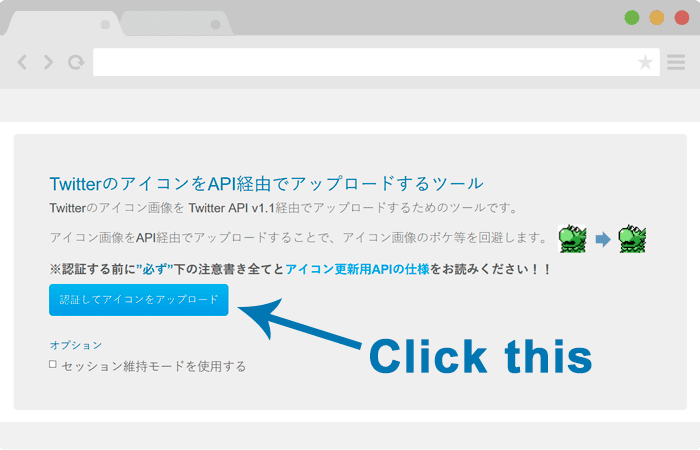 Click the large blue button to reach the authorization page. 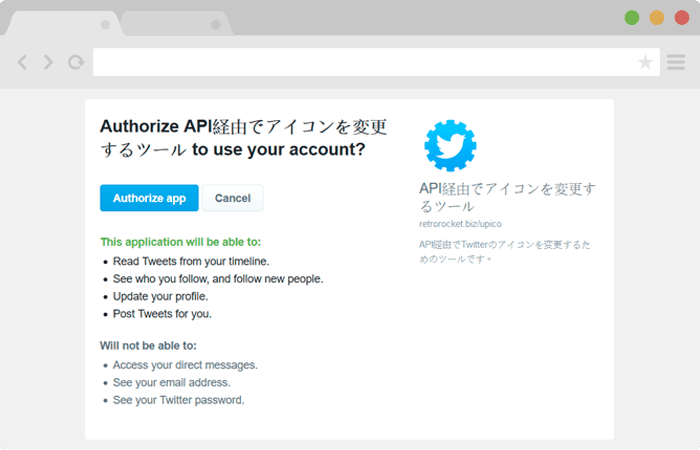 Click "Authorize App". We have experimented with the Twitter app and it does NOT follow new people or post tweets for you. It only serves to update your Twitter profile picture. You can always revoke access to the app at any time, for example, after you finish uploading your Twitter Avi. Click "Browse..." to select the Avi image file you've already prepared according to STEP 1. Click "OK" to start uploading the profile picture. Wait for a few seconds and the upload will finish. 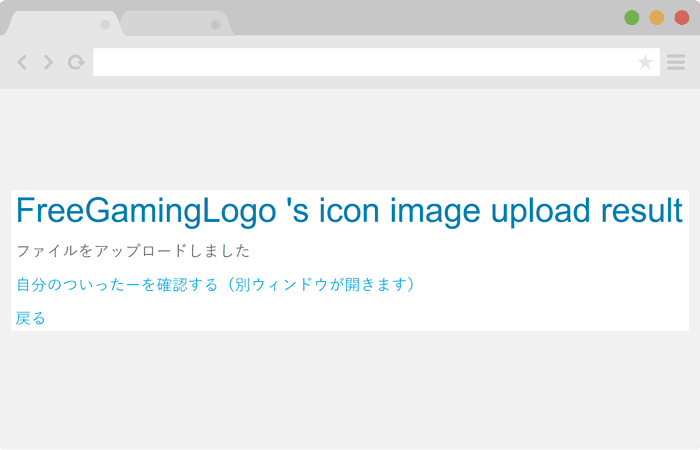 The Twitter Avi uploader will show the following page if the upload is successful. Now, go to your Twitter profile and check out your newly updated Avi or profile picture. Amazing, isn't it? 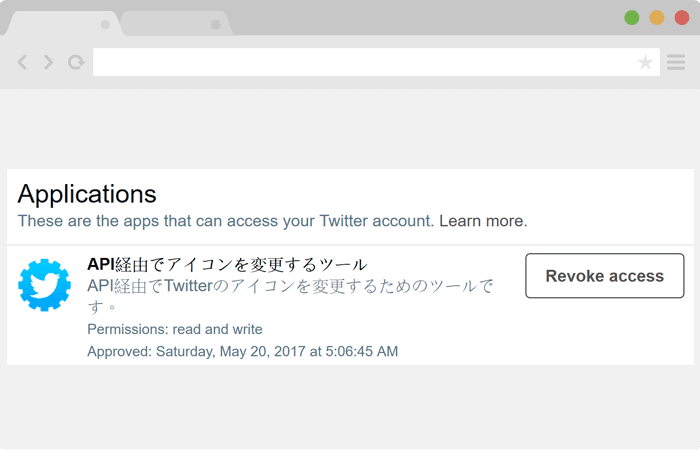 Some tech-savvy people may not trust the Twitter app they just used and may doubt what it will do to their Twitter accounts in the future. If you're one of them, visit Twitter applications setting to revoke access of the app. 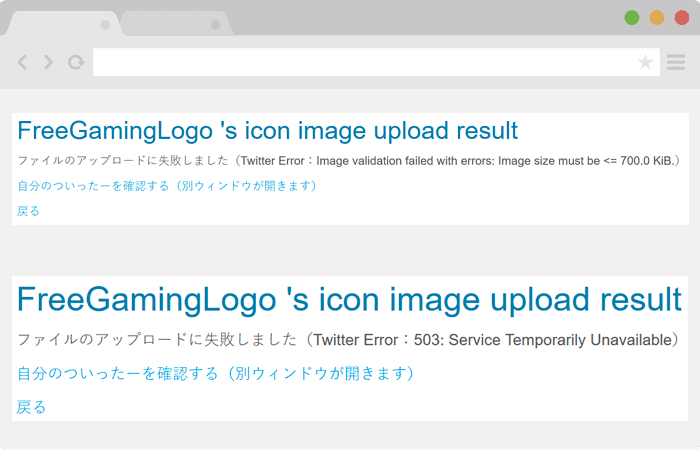 There are some errors you may encounter when using the Twitter Avi uploader. 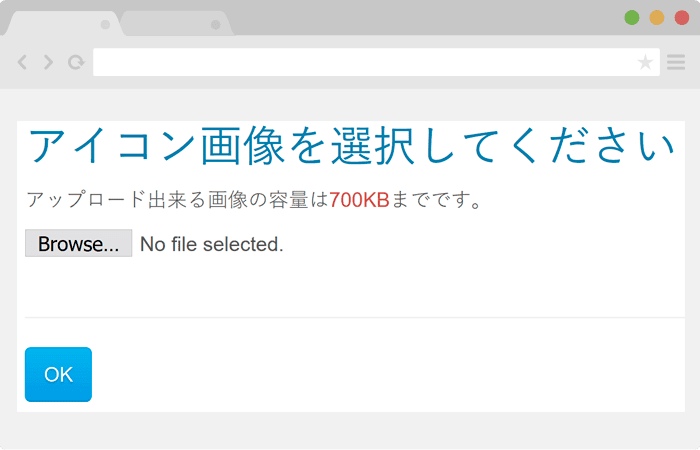 You are guaranteed to get an error if the uploaded image size exceeds 700 KB. You can't expect to upload a hi-res photo in its original dimension with the size limit. If you get a 503 error when the size does not exceed 700 KB, try to upload an image with a smaller dimension. Experiment yourself to find out the maximum dimension that the uploader will accept to achieve optimal results, as every image differs. Have you tried our method to fix your blurry Twitter Avi? Does it look crisp and clear? Feel free to share your thoughts. Share this to the community so there will be fewer complaints about the quality of Twitter profile picture! If you come across any method to upload Twitter profile image which is superior than our method, let us know. You can also comment below if you need any assistance. Are you looking for free gaming logos? Struggling to find GFX gaming logo designers that do quality logo designs on Twitter, Facebook, Steam community, gamer forums, reddit and elsewhere you can but in vain? Looking for some premade concept logos but they're too expensive that you can't afford? You've come to the right place. Here comes a large collection of free to use gaming logos with vector files. Get your eSports team ready now! It's tough to provide free gaming logo resources with vectors. That's why we need your support. Bookmark our site and visit regularly. Share the logos, pin them. Share our site in social media. Backlink our site. Read and share our tutorials and resource articles. We strive to keep the logo download links fast and clean! We're passionate to serve the gaming community. Any help to spread the word out is greatly appreciated! ALL GAMING LOGOS AND THEIR VECTORS, UNLESS OTHERWISE SPECIFIED, CAN SERVE AS INSPIRATION AND REFERENCE, LICENSED UNDER CC BY 4.0.